Links and things that I’ve run across recently. I love Weird Al, but I’ll fight to the death your right not to care one way or the other! The Onion told a heartbreaking story a whole month ago about one peaceable gentleman who was intimidated by his so-called friends into actually having an opinion on Weird Al. Shocking! That this could happen in America! 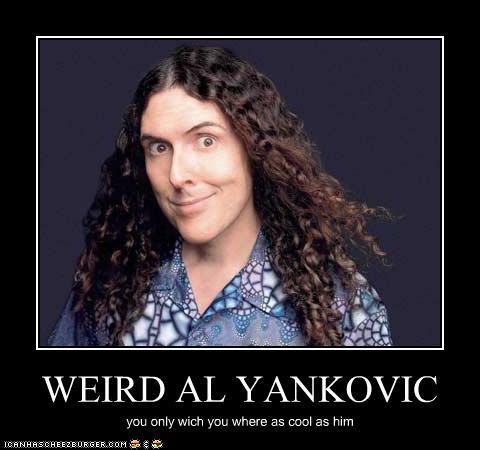 Of course, if the story wasn’t about Weird Al, I wouldn’t have mentioned it at all, seeing as how big of a groupie I am. Also from the “That is sooo yesterday’s news!” files, if you still don’t understand the Higgs Boson, this animated comic might help. Or maybe not. But it’ll likely entertain you, anyhow. When you click on the link, your browser is taken to a page that looks an awful lot like Twitter—so much that you might not notice the subtle differences—which asks you to login to Twitter. The idea is that you’ll enter your Twitter username and password. Then the attacker uses that information to crack into your account and add an app to it that warns all your friends—because you apparently are too insensitive to do it yourself—that someone is posting really bad rumors about them, too. If you’ve already been bitten by this scam, change your Twitter password immediately, and revoke access for the rogue app so that it won’t be able to spam your friends anymore. I’ve finally gotten to back-email from a month ago. (But that’s not why most of the bits here are a month out of date.) In my inbox I ran across this story by Ari Galper that I just had to share. What happened when his son’s hip popped out of its socket? A truly inspirational story. I’ve begun substituting the word gut for heart in common conversation. When you say someone “feels something in his heart,” or he’s “following his heart,” what does that really mean? That’s not what we mean today when we talk about the heart. What we really mean is the seat of the emotions, the passions, what the ancients called “the belly,” the gut. Moreover, phrases like “from the heart” have become such clichés, I’m not sure they really holds any metaphorical impact anymore. So I’m going back to the verbiage of the ancients in part, and adopting modern verbiage in part. Rather than talking about “the heart,” which no one seems to really understand, I now talk about thinking something in your mind and feeling it in your gut, the two parts of our consciousness. I’m often asked: Why did Spock smile and limp in the first Star Trek pilot? The answer: I was told to smile by the director, to limp by Gene Roddenberry.